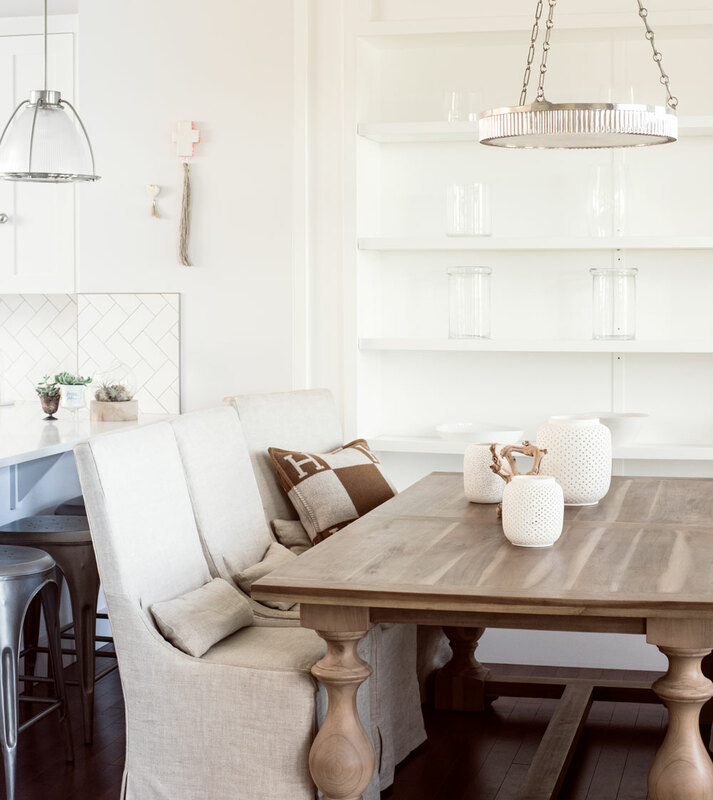 Homeowner Sarah Swanson keeps things simple and seaside-inspired in her dining area. 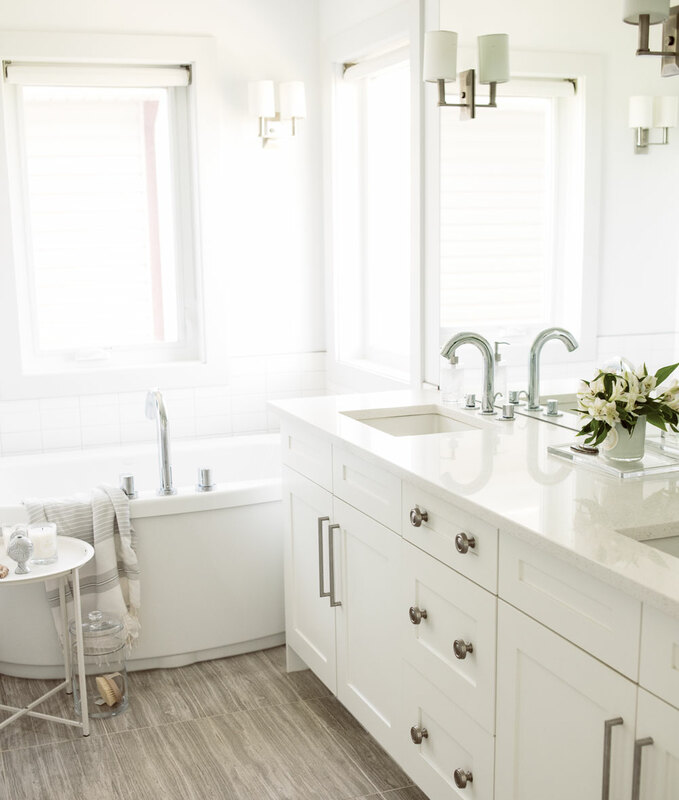 Nestled by a scenic pond in the southeast Calgary community of Copperfield, Sarah and Kevin Swanson and their two daughters, Calleigh and Lauren, reside in a house inspired by the casual yet refined homes of California. An “e-designer” by trade, Sarah works out of her home and has made it embody her fresh and clean design aesthetic in every way possible. Sarah’s job title is one that may require a bit of an explanation: she is an interior designer who consults with clients online only. Working with customers all over the world, the designer comes up with the drawings and plans for rooms and homes, helping clients to acquire furniture and products that ensure the desired look is achieved. Entrepreneurial in more ways than one, Sarah also helms the very popular Gallery Wall $10 Art Etsy shop featuring simple, yet beautiful custom paintings for, yes, $10 a pop. A big fan of styling gallery walls, Swanson’s idea for the company came out of the belief that art should be affordable to all. Beyond that, she shares her design and style inspirations and travels on her blog, Flourish Design & Style. Her busy family of four is always on the go or entertaining friends and family, and it was important to the Swansons to create an oasis-like atmosphere where relaxation is the No. 1 priority. Homeowner Sarah Swanson loves to cook, so she wanted to create a kitchen and living area that is perfect for entertaining. “We seem to always have lots of people over on the weekends – quite often the whole family joins us for dinner. It is spacious enough to accommodate everyone without feeling cramped,” she says. By keeping the area white and airy, the focus remains on the people and conversations that flow through the room. The open-concept space boasts an entertaining-headquarters trifecta with the kitchen, dining room and living room all in the same common area. The bright white kitchen reflects the family’s view of the neighbouring pond, while the soft wood tones of the dining area serve as the perfect backdrop for the Swansons’ collection of glass. Small details and features, such as the kitchen’s herringbone-pattern backsplash and the built-in bookshelves in the dining room, give the home a decidedly custom feel. With its expansive views of the pond outside, the Swansons’ master bedroom is an instant mood-elevator. And it’s likely due to what’s not there more than what is. Swanson keeps the ensuite pared back and minimalist, saying, “everything has its place and the things we have out are intentional and personal. The tone-on-tone neutrals of the room, and all the other bedrooms, keep things fresh and comfortable, although Swanson isn’t afraid to throw in a bit of colour – once in a while. She will add brightly coloured flowers or soft pastel-toned art to the mix. But it’s her use of texture that creates the most visual interest throughout the home. Natural sea grass, sisal, wicker, wrinkled linens and distressed woods add depth to the white walls and clean lines. Pieces of driftwood, lush terrariums and fresh flowers throughout Sarah Swanson’s home nod to her love of nature, one of her greatest inspirations as a designer. Each room has an airy and bright feel, reminiscent of beachy bungalows on the West Coast. 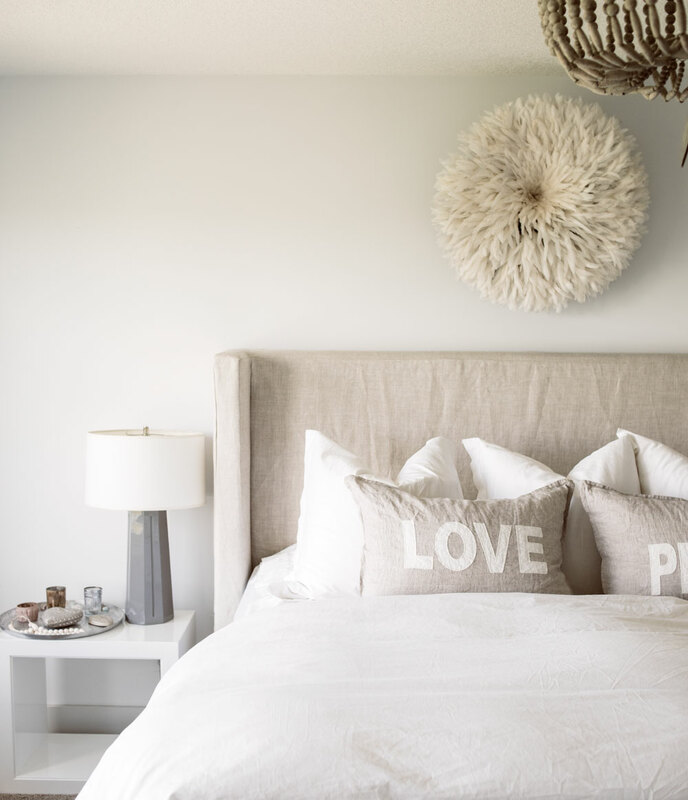 The whole home embodies that easy-breezy California vibe not often seen in many Calgary interiors. You wouldn’t guess it, but her previous house was filled with colour and hits of dark wood. 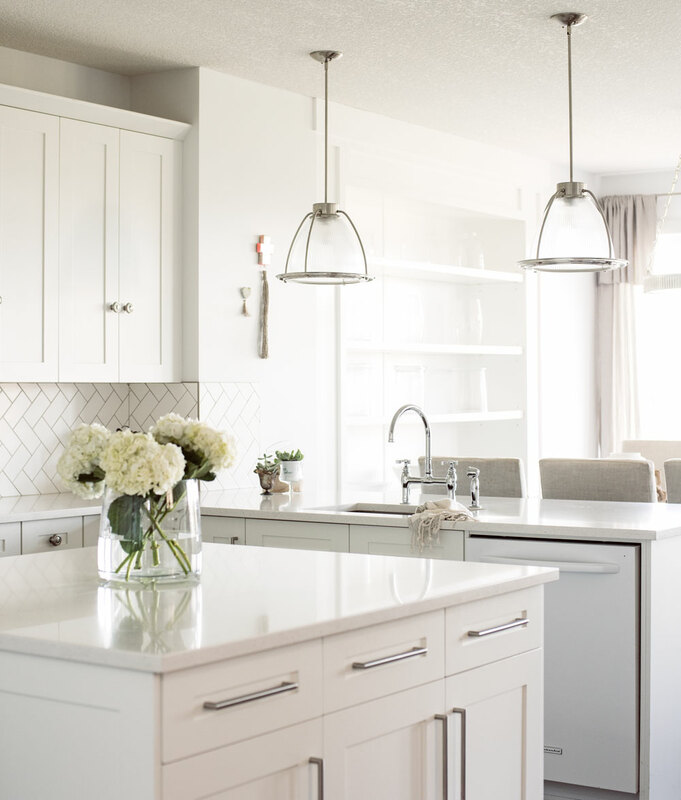 When the couple bought their current home, which was built by Calgary-based Stepper Homes, Swanson decided to go in a completely different direction with the decor. And, while it’s beach-inspired, it stays away from typical seaside clichs. 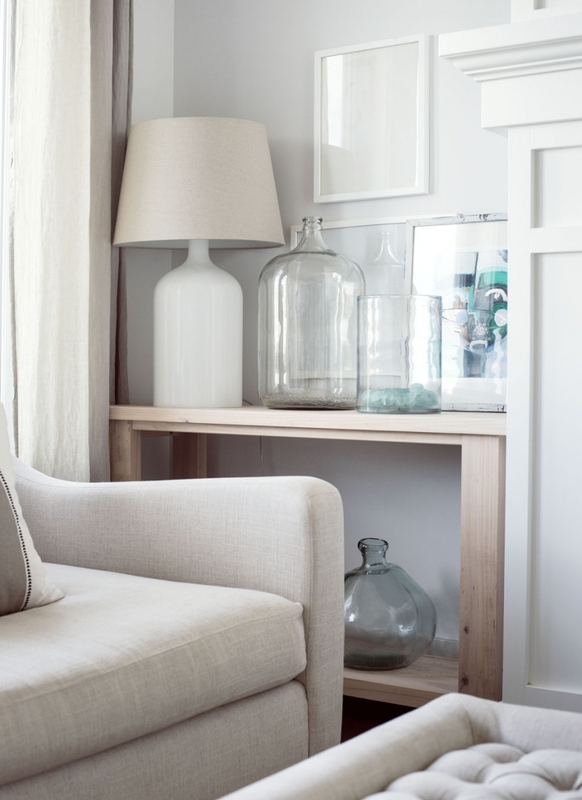 Layers of natural decor add a soft and serene vibe to the living space. 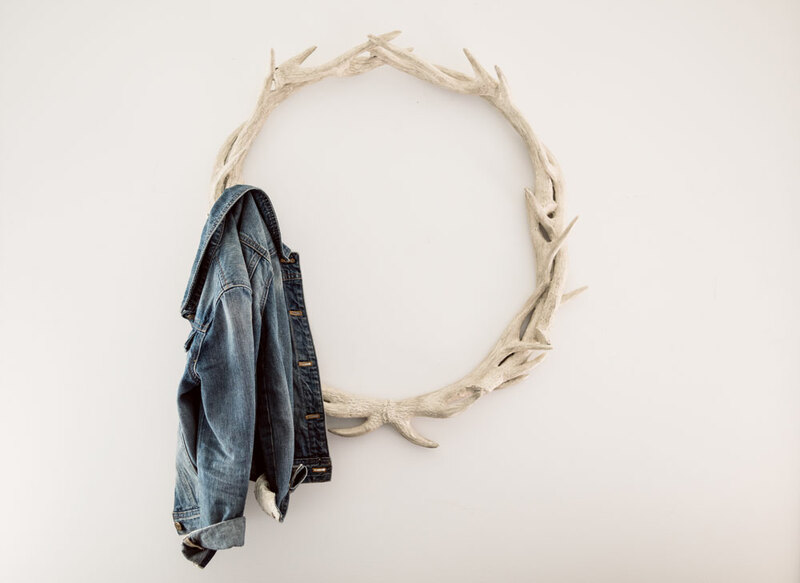 An antler wreath does double duty as an adorable spot to hang a jacket. The living room, with its neutral palette and array of art and tactile pieces, is Swanson’s favourite place to unwind. The heart of the Swanson household is the kitchen. Since the house is a Stepper home, details such as the herringbone subway tile backsplash make it look custom built. Swanson expresses her eclectic side through objects such as this grouping of teak spoons. 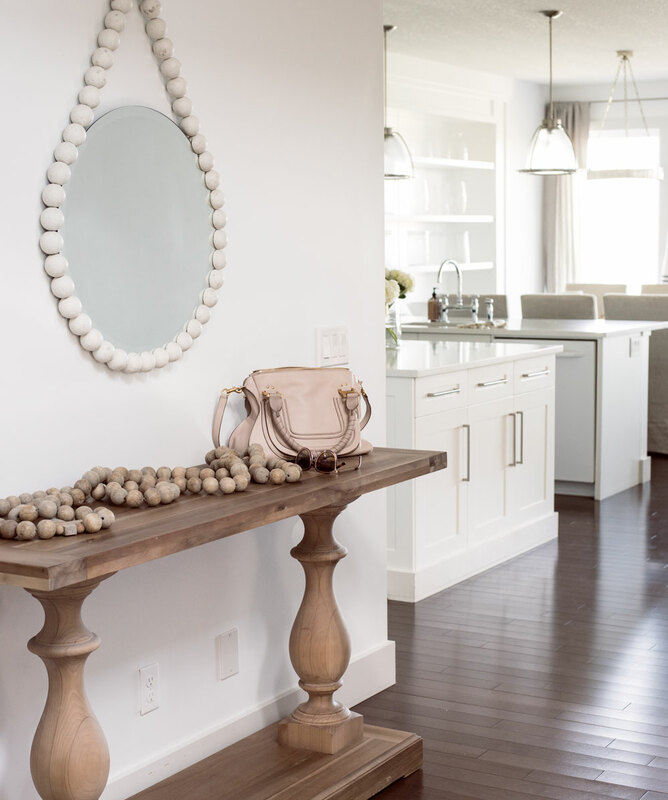 An oversized mirror from The Cross Decor & Design in Vancouver makes a big statement in the front hallway. In an effort to eliminate the daily clutter of life, Swanson keeps her principal suite in spa-like condition. Several vignettes of found objects and books are displayed in a hutch by the front door. The principal bathroom is a calming space that has an ever-rotating collection of objects. 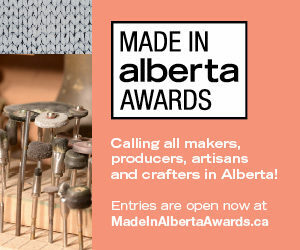 Mix things up and add interest with woven blankets, faux fur and linen. The subtleness of the mix still reads as light and fresh. Yellow, pink, blue – white gives you such a great backdrop. 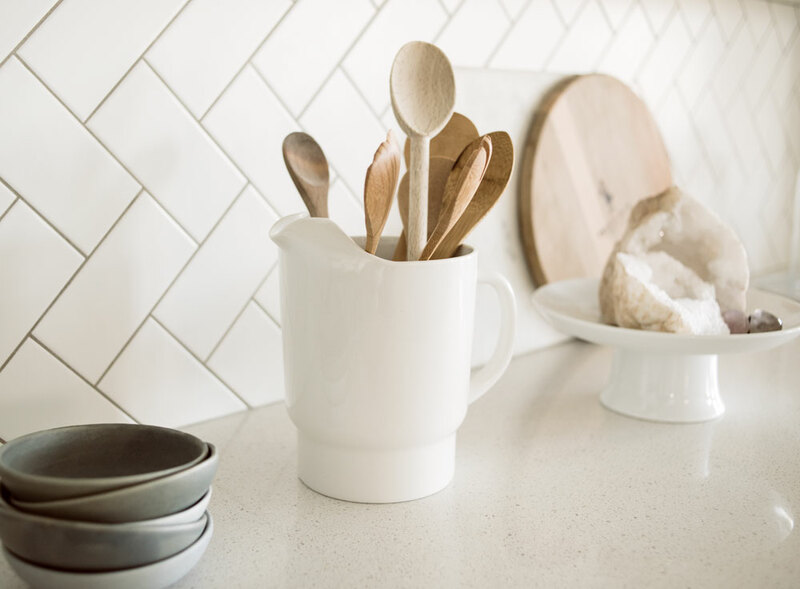 Use white appliances for a seamless look in a white kitchen. 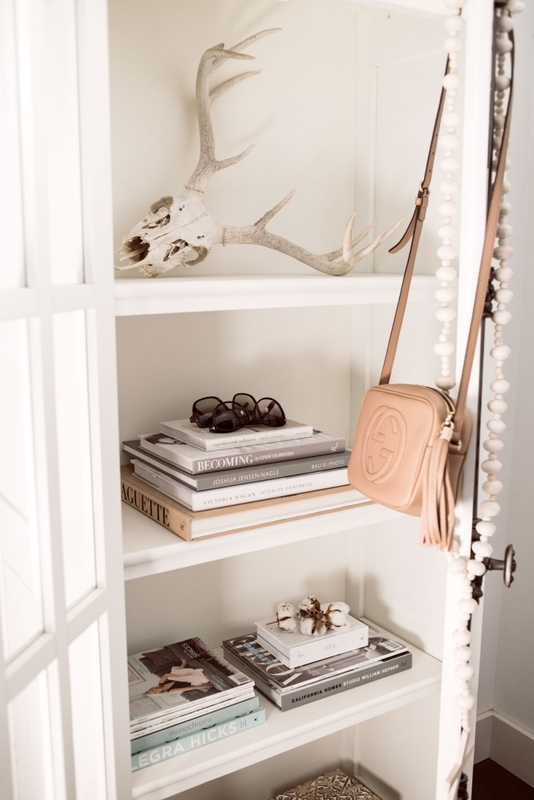 Warm up a space by adding wood with white.